On December 12, 2015 me, my son Jeremy, and the guys from our hunt camp decided to give it a last shot for the season. 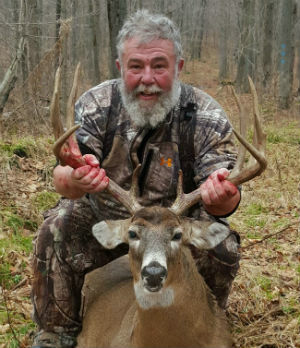 The funny thing is my son and I were going to go to North Collins to hunt, but one of the guys from camp, Mike Prinzbach, talked us into going to our hunting camp in Franklinville, NY... Boy, am I glad he did. That morning I went to my tree stand without even a thought of seeing a deer. It was almost 50 degrees and nothing was moving. So as always, the first thing I do when I get in my stand is say a little prayer and ask God to keep us safe and for a good day of hunting. My good friend Wayne Bruno who owns the camp that we stay at had a brother, Ross, that use to hunt about 30 yards from were I put my stand. A few years before my son and I joined the team Ross was hit by a car and was killed. So that morning I also said to Ross, "I never got to meet you, but I feel as though I know you so if you can send a nice deer my way. At about 10:15 that morning I was looking to my right when all of a sudden I felt as though something was telling me to turn and look up the hill to my left. At the top of the hill was a deer with its head down. It started to walk across the logging road and down toward me in the thickets. It got about 80 yards away when it finally picked up its head and I saw antlers. I did not know how big he was. He started walking broad side to me and I never looked at his head again. When he hit a clear spot and my cross hairs hit his shoulder I squeezed the trigger. He took one jump and down he went. My son came over and we went up hill where my son found him. As I came up behind him he said, "Dad he is a monster." When I finally saw him on the ground my son had to hold me up I was so excited. My first deer for the wall in 47 years of hunting and the biggest deer of my life he scored 150 3/8 gross and 140 5/8 net. But the best part of it all was my son being there to enjoy the excitement with me.